KGB Kiteboarding, offering kitesurfing lessons and kiteboarding gear, is announcing discounts on kiteboarding lessons through Groupon and AAA Deals starting on March 20 and March 21. The seasonal winds have returned to the bay along with early spring warm weather. With KGB Kiteboarding expecting a very windy 2012 season, KGB Kiteboarding is offering an upcoming Groupon deal for discounted kiteboarding lessons. 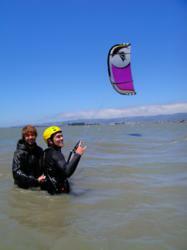 Beginning March 20 on Groupon San Francisco, KGB will feature half off the following three lessons: a one-hour introduction to kite piloting for $29, a two-hour private beach lesson for $99 and a four-hour learn to kite lesson for $169.00. The deal with AAA deals will include a discounted four-hour lesson for $169, as well as an one-hour lesson for $29. KGB Kiteboarding is reopening its KGB Kiteboarding gear retail store and the IKO-affiliated kiteboarding learning center for the 2012 spring and summer season starting on April 1. The opening is dependent on windy weather. The kiteboarding gear and lessons center will also feature its new 2012 kiteboarding gear from many top brands that are now available in the retail shop. KGB Kiteboarding is open seven days a week from 10 a.m. until 7 p.m.
“In addition to adding many new brands in our shop, the 2012 season is shaping up to be one of the windiest on record for the Bay Area. We are very excited to have some new faces on our instructors team and are expecting many students to keep them busy,” Vaughn said. Whether looking to take kiteboarding lessons to learn how to kiteboard or searching for new kiteboarding gear or in need kitesurfing gear repairs, customers will find that KGB’s great selection and knowledgeable staff make it a one-stop-shop for kiteboarding. “I got in touch with Royce about a kiteboarding kite. Long story short, he listened to what I wanted, made various calls on my behalf to find the best price and took care of everything. Pleasure dealing with KGB then and hopefully in the future,” recent customer Stepan S. said. For more information about the upcoming promotion or any of KGB Kiteboarding’s products or services, call 888-411-0732, view the website at http://www.kgbswag.com or visit 3310 Powell St. in Emeryville starting April 1. KGB Kiteboarding is the San Francisco Bay Area’s kiteboarding headquarters that offers everything when it comes to learning kiteboarding. It is the best source of everything kiteboarding, from enrolling for lessons to buying gear and repairing accessories. Not only is it the best shop for kiteboarding, but it also teaches snowkiting and powerkiting.